I continue to be impressed with the re-generated Volvo car range both by the overall product quality and by the sage model range that the famous Swedish brand is establishing. This individualistic car maker has not abandoned the rural customer types who chose a Volvo because it served them well in some of the more testing area of the land – they can be seen now in some versatile XC60, XC70 and the latest XC90 all-wheel drive machines. However, what is evident is that the company is making a strong challenge in the more conventional market sectors by producing a range of attractive saloon and hatch back models that exhibit distinctive and more than slightly exciting styling. 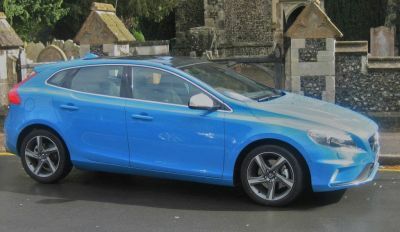 I first made this observation when I tested a Volvo S 60 Saloon and now I am equally impressed with my experience at the wheel of the Volvo V40 5-door hatch-back that exudes ultra-modern ‘go faster’ looks while also suggesting a strong touch of class. This is exactly what this particular Volvo offers plus some sensible and exciting power options, ranging from the more than acceptable turbo diesel 1.6 – I have been driving right up to a 2.5 turbo petrol 254 bhp all-wheel drive version. There are also several specification levels and a seriously long list of options to enable the buyer to create an individual car. The test car’s 120 bhp output clearly exemplifies the progress being made in car engine efficiency, from this relatively small capacity diesel unit Volvo has extracted a creditable 120 bhp in a surpassingly willing and unfussed manner. Driving through a dual mode automatic transmission unit offering Sport and Economy modes it provides character performance – lively or relaxed, and an easy drive or an involved one depending on the driver’s requirements. Top speed is a claimed 121 mph with 62 mph reached from rest in a passable 9.9 seconds. As to fuel consumption, the Combined figure is a quoted 53.3 mpg and the on-board computer constantly came up with 49.9 mpg so I reckon under mixed driving conditions a respectable 48 mpg should be feasible, giving a range of around 650 miles – not bad at all! It is evident that Volvo has not cut any corners to create a very competent handling car with excellent road grip and ride qualities through a fully independent suspension system, smoothly efficient braking via an all disc set-up and responsive/smooth gear changes from that 6-speed automatic. It did not take me long to feel at home in this car, the seating support is to a high standard with plenty of adjustment, the steering column has rake and reach adjustment and the positioning of the alloy shod pedals could not be better. The fascia is smart in a modern way with plenty of computer and digital use that proved easy to live with. The driver vision is better than I anticipated – a proximity warning system built into the exterior mirrors also makes a lot of sense. 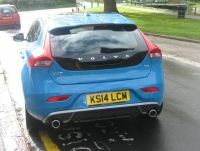 The test car was loaded with around £9,000 worth of extras, all of which might not be taken up by the buyer but it is useful to see what is available, especially as the standard package on this D2 Nav version included such items as climate control, information /centre, Bluetooth hands free system, chilled ‘glove’ compartment, satellite navigation system, Comfort/Touring Chassis, headlight levelling, day running lights etc. Also that familiar Volvo touch – a clip on the windscreen for those non-adhesive pay and display car park tickets. There is no compromise when it comes to passenger comfort or luggage capacity. A most generous boot space, augmented by the usual 60/40 split folding rear seats. And what did I spy under the boot floor? A real spare wheel! This Volvo has also inherited its predecessors’ safety DNA. There’s full air bag protection including a driver knee bag. Whiplash protection for the two front occupants, City safety system, an Intelligent Driver Information system, Stability and Traction Control and Home Safe and Approach Lighting. Build quality is up there with the best while interior ambience/finish , enhanced in this case with cost extra leather upholstery, is impressive. Truly an executive/premium class product if ever I saw one. What next from Volvo? A sports car? MAIN RIVALS: Renault Megane Coupe, Alfa Romeo Giulietta, SEAT Leon Coupe, Audi A3. Price: from: £24,295 –- as tested £33,160.